DIE Lunæ, 22 die Octobris. Message to H. C. with it, and Ly. Eliz. Noel's. Message from H. C. for a Conference, about French Commodities. Viscount Say et Seale. Ds. Arlington. Hodie 1a vice lecta est Billa, "An Act for the Illegitimation of the Children of the Lady Anne Ross." Hodie 3a vice lecta est Billa, "An Act for naturalizing of Ester Le Lou, the Daughter and Coheir of Gideon Le Lou, Lord of Colombieres in Normandy, the now Wife of the Right Honourable Denzell Lord Holles of Ifeild." 1. 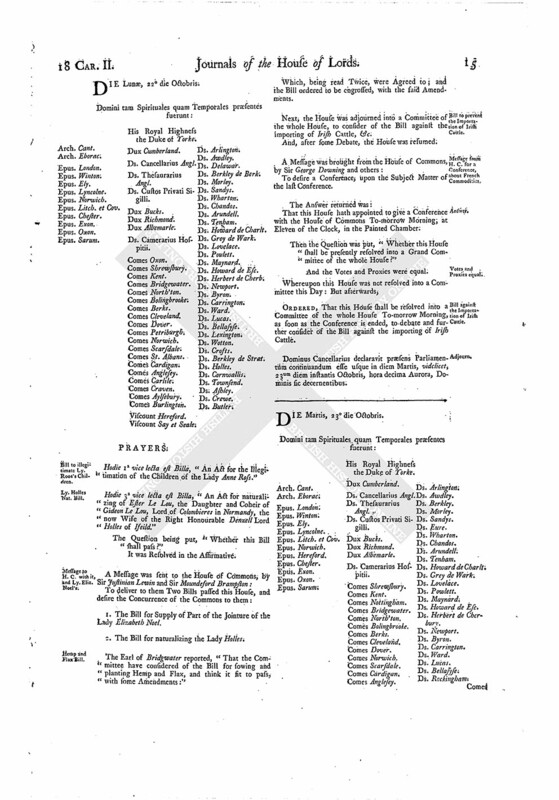 The Bill for Supply of Part of the Jointure of the Lady Elizabeth Noel. 2. The Bill for naturalizing the Lady Holles. The Earl of Bridgwater reported, "That the Committee have considered of the Bill for sowing and planting Hemp and Flax, and think it fit to pass, with some Amendments:"
Which, being read Twice, were Agreed to; and the Bill ordered to be engrossed, with the said Amendments. Next, the House was adjourned into a Committee of the whole House, to consider of the Bill against the importing of Irish Cattle, &c.
And, after some Debate, the House was resumed. To desire a Conference, upon the Subject Matter of the last Conference. That this House hath appointed to give a Conference with the House of Commons To-morrow Morning, at Eleven of the Clock, in the Painted Chamber. Then the Question was put, "Whether this House shall be presently resolved into a Grand Committee of the whole House?" And the Votes and Proxies were equal. ORDERED, That this House shall be resolved into a Committee of the whole House To-morrow Morning, as soon as the Conference is ended, to debate and further consider of the Bill against the importing of Irish Cattle. Dominus Cancellarius declaravit præsens Parliamentum continuandum esse usque in diem Martis, videlicet, 23um diem instantis Octobris, hora decima Aurora, Dominis sic decernentibus.